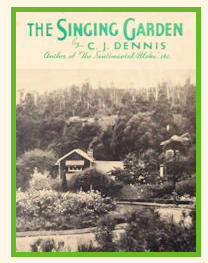 A mention was made in the previous post about the bird poems of C. J. Dennis. Several people have since asked about this and I have to thank my poetry reading friend ML for alerting me to this several years ago. Although I've never seen it in print the book is beautifully represented on this website which shows all the poems the book contains and will keep you happy for hours!